Winter Camping in Nuuksio National Park – Easy-Peasy or Hell on Earth? I couldn’t help wondering if it was the most stupid idea ever to go winter camping in Nuuksio National Park right after the temperature dropped below -15 degrees for the first time in Southern Finland this winter. Do you want to know the truth about winter camping? It can be fun and awesome, or it can be a living hell and feel like torture. Again, this is one of those stories with a lesson; don’t do what I do but do what I say you should do. And now, it’s time to tell you why. I’m going to tell you a secret. Before I took the winter camping challenge at the start of February, I told everyone it would be my first overnight winter camping experience in 25 years. And I wasn’t even lying too well as I wrote about my freezing night in Koli National Park two years ago. It wasn’t even supposed to be an extreme winter camping trip. I planned it as a peaceful and cosy night in a camping hut surrounded by the most stunning Finnish landscapes. But it turned out to be exactly the opposite of all that. Our winter excursion in Koli National Park was the worst kind of example of winter camping in Finland. Today, it’s just another funny story that I can laugh at, even if it didn’t feel too hilarious at the time. And thanks to our trip to Koli and my recent winter camping experience in Nuuksio National Park, I can honestly encourage you not to do what I do but to do what I say. This is the story about how you should start winter camping. And how I should have done it, too. Imagine you’ve never tried swimming. Maybe you haven’t – I can’t know for sure. Once you finally arrive at your dream destination, let’s say an exotic island in the Caribbean, you wouldn’t jump into the water immediately and go free-diving, would you? The same applies to winter camping. There’s no reason to jump blindly into the unknown. Taking day trips in winter conditions is at least as fun as staying outdoors overnight. It can be quite extreme, too. Don’t even consider assembling a tent before you’re sure you enjoy hiking, skiing, snowshoeing or just chilling out in snowy and cold conditions. If worse comes to worst, you’ll freak out so badly you want to give up before you even get started, and only because you weren’t prepared. The most comfortable way of getting started with wintery outdoor adventures is to stay in a nice hotel and take day trips to nearby nature. It’s exactly what I did on my outdoor weekend in Pori at the end of January (and I really enjoyed it). If taking day trips feels like something only a wuss would do, please feel free to repeat my winter camping mistake I made in Koli National Park. But don’t you dare to come back and say I didn’t warn you! On Finnish winter nature day the 3rd of February, we gathered at the Finnish Nature Centre Haltia in Nuuksio National Park with a bunch of beginners as interested in winter camping as I am. Feeling a bit nervous but excited, we were more than ready to take the challenge and face our first winter night in a tent (for me, since childhood). Besides us rookies, some 60 experienced winter campers had arrived at Nuuksio with their tents and other types of accommodation, willing to take the winter night challenge with us. Despite the excitement, it was relieving to know we’d be sleeping in Savotta’s brand new Hawu tents that are equipped with a stove. As long as there’s a fire in the stove, our tent should be warm and cosy, no matter how low the outdoor temperature gets during the night. While us rookies were testing Hawu stove tents (the first picture), more experienced winter campers didn’t require a tent at all. Some slept under the stars, some in a simple lean-to. It was interesting to see so many different ways to camp. I was most nervous about the fire watch shifts. Not my shift, but the others. I’m like the worst sleeper ever. Even when I’m sleeping comfortably in my warm bed, I need to take melatonin to sleep well. A thought of fellow campers jumping over me every half an hour to add wood to the stove made me stiffer than the freezing weather in Nuuksio National Park. I was lucky to camp in such great company. Others understood my struggles and let me have the first go. This way, I was able to take my melatonin to guarantee at least some sleep and a safe drive home the next day. Some weren’t as lucky as I was. The rest of the shifts were decided by drawing straws. We survived! Our rookie group (plus a couple of pros) after the night of winter camping in Nuuksio. Winter camping challenge was a perfect way to get started. Not only because we got to borrow the equipment but because of the educational and instructive program in Haltia. Anyone could come to listen to the presentations of the Finnish winter camping pros like Teemu Suominen and ‘Livingstone of the local forests’ a.k.a. Joppe Ranta. Perhaps you can find a similar event in your area, too? Ask around for local outdoor enthusiasts and associations to guide you in the correct place. A photography-themed winter walk in Nuuksio National Park guided by our host Nella, the award-winning travel blogger and founder of #suomiretki movement on Instagram. Besides the presentations and pro tips, the day was filled with camping gear exhibitions, camping food tastings, exciting camping stories and sauna with ice-swimming (of course, we’re in Finland after all). The best way to start is to find both, experienced campers and total beginners, just like yourself. Thanks to pros, you can learn about the gear and how to prepare for your first solo camping trip. With fellow rookies, asking questions from those pros is easier. Plus you get to share your thoughts and feelings with like-minded people. 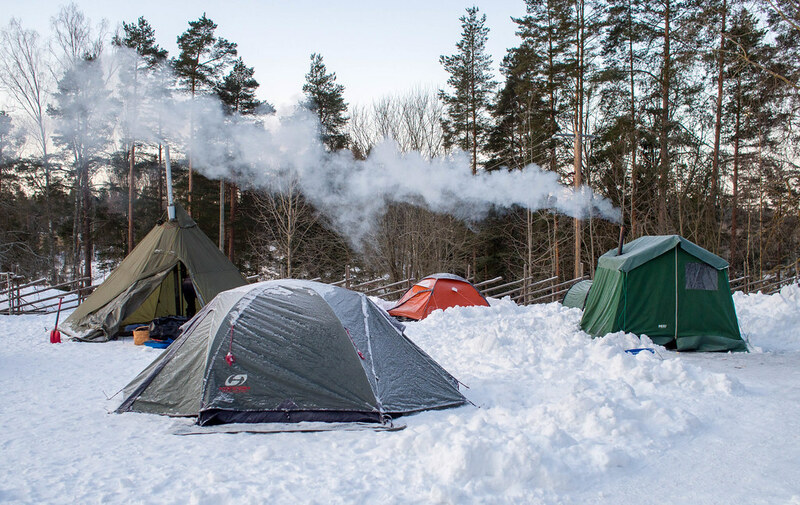 Keep an eye on events like winter camping challenge which will be organised in Nuuksio also next year. Perhaps you’d like to join? It’s easier to start when you have lots of people around you (plus running water and proper toilets help, too). But where to get the gear for the first winter camping experience? I get it, camping equipment is expensive, especially when they’re made for extreme conditions. You don’t want to spend hundreds of euros for something you might try only once. Don’t worry! If you don’t know anyone who could borrow you the gear, in Finland, you can find many places where you can rent camping gear for a really affordable price. Try RetkiRent, Ruljanssi or Liizi, just to mention a few. How did it go? Did I survive the winter camping challenge in Nuuksio? I did survive, and I actually enjoyed the experience… at least some parts of it. As you might have guessed, I didn’t get much sleep. The temperature wasn’t the reason. It was the firewatchers who had to crawl next to me and open the noisy hatch every once in a while to add wood to the stove. At least I learned that even melatonin doesn’t work in challenging circumstances. Am I giving up on winter camping? Hell no! But due to above-mentioned reason, I’m now convinced that my next step will be investing in proper gear and practising on my own in local forests where I have a chance to escape to my cosy bed in case the night gets too cold. It seems like group camping isn’t for me and my poor sleeping skills. Even if I had very little sleep, in the morning, I felt brisk and well awake. There’s something magical in sleeping outdoors. You’ll always feel rested even if you lack sleep. The winter camping trip was crowned by the morning coffee, of course, and the delicious raspberry porridge served by Biwak. I’ve always been a bit suspicious about these camping foods (even if I’ve never tasted them before), but all the food I got to taste during this event softened my attitude a tad. The fire watch shift was fast and painless. Of course, it was easier when I got the first shift (but to my defence, it was also longer than anyone else’s). Even if I had two tents and stoves to take care of, the fire didn’t need much attention which gave me an opportunity to practice night photography. Thanks to this, I’ll always remember my first winter camping challenge as the night I took my first proper shot of the moon. This picture is my call for you; the card challenges you to spend at least one night outdoors in all four seasons. I’ve crossed my first one. Now, it’s your turn. Do you dare to take the challenge? Say YES if you are! Do you feel skilled with the Finnish language? Read the article I wrote for the newspaper Länsi-Suomi about winter camping in Nuuksio. Pdf opens when you click the picture below. A Freezing Night in Koli National Park: Nice Try From a Wuss Hiker or an Unforgettable Extreme Experience? StarTribune: Want to start winter camping? Here’s where to start! Interview with Finnish wilderness guide Erik Simula. previous post: Winter Outdoor Activities in Pori, Finland – Are There Any?